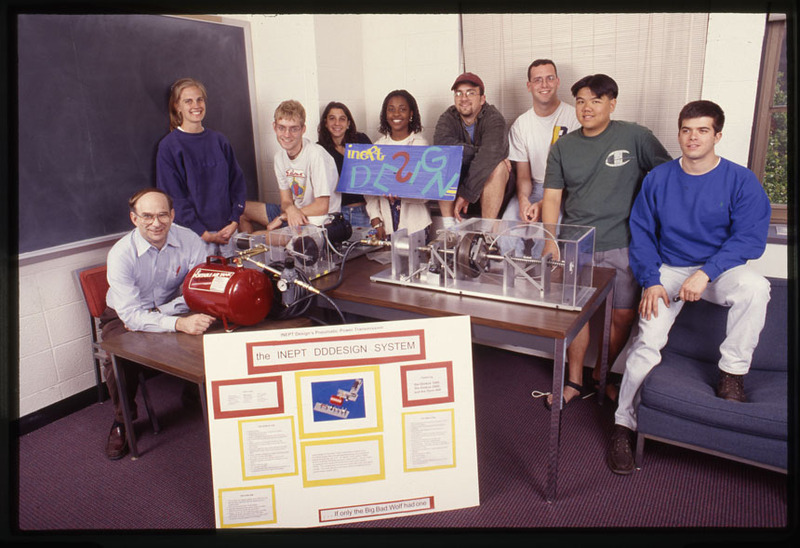 David Quesnel, at left, with students in one of his senior design teams. When David Quesnel taught senior design, he did it in a big way. Instead of splitting the class into small teams of three to four students, with each team doing its own project, the professor of mechanical engineering would sometimes involve the entire class in a single, industrial scale project. In 1997, for example, his 30 design students built a 15-foot-long injection molding system that converted chips of recycled plastic yogurt containers into yo-yos. Two years later Quesnel’s class completed a 3,000-pound ultrasonic welding machine for a real Rochester company to make polypropylene cardholders and passport sleeves. Another year, he split his class into three competing companies, each working independently on pneumatic power systems to replace electric motors in factories. Quesnel believed that was the most realistic way to prepare students for the workplace – and to build their confidence. Quesnel relished challenges, according to the testimony of friends, family members, and colleagues at a recent memorial service in Rush Rhees Library. And it was typical of him to tackle those challenges with an “unbounded curiosity” and an ability to focus rigorously on the task at hand. That was how Quesnel taught himself to sail on Seneca Lake and, in his 40s and 50s, to windsurf on Lake Ontario. That was how he completed numerous home remodeling projects. How he created a device—that filled a third of his garage—to pull tree roots. And how he reconstructed accidents as an expert witness. Born in Keesville, New York, Quesnel took construction and roofing jobs during the summers to help pay his way through SUNY Stony Brook as an engineering undergraduate. “I think this gave Dave an appreciation of physical labor” so that, even when his research delved into abstract theory, “most of his ideas tended toward practical applications,” says John Michejda, Quesnel’s roommate at SUNY Stony Brook and a lifelong friend. Metal fatigue—what happens, for example, when you bend a paper clip over and over until it breaks—continued to be Quesnel’s research focus when he joined the University of Rochester later that year as an assistant professor in what was then called the Department of Mechanical and Aerospace Sciences. One practical application was a simple tool Quesnel devised with Eric Stromswold, one of his PhD students. Similar to a torque wrench, it could test how well a metal would resist the growth of a crack within it. The device sold at a mere fraction of the $50,000 price range of other testing devices then on the market, wrote Bob Reeg of the National Society of Professional Engineers. However, in his research, as in his hobbies, Quesnel continually found new areas to explore. For example, Quesnel later studied the adhesion of particles to surfaces, coauthoring a textbook on the subject. And then, at a point in his career when some faculty members might start slowing down, Quesnel began to explore a topic that had always interested him: corrosion, an electrochemical reaction that may significantly compromise the strength of aluminum used for ships. He became expert in the way corrosion is exacerbated in the confined areas where two different materials come in contact, and developed a numerical model to predict corrosion under those conditions. “For the last 15 years, his research underwent a renaissance,” Lambropoulos says. Previously, Quesnel’s research had been “comfortably” supported by the National Science Foundation and Sandia Laboratory. More recently, the Office of Naval Research became the primary funding source, awarding Quesnel grants totaling nearly $3 million between 2003 and 2012 for research involving both corrosion and piezoelectric materials. And then, when it became apparent there were “many more jobs for my students in the area of energy storage,” Quesnel wrote, his lab again shifted focus, to exploring ways to build better batteries. During a research career spanning four decades, Quesnel wrote or co-authored more than 120 papers, and was awarded 13 US and European patents. He advised 20 PhD students and 18 masters students. At one time or another, he taught two thirds of the department’s undergraduate courses, Lambropoulos says. A National Science Foundation Graduate Fellow as a student, Quesnel later received a Humboldt fellowship for a year-long sabbatical at the University of Erlangen-Nuernberg. He was recipient of the Ralph R. Teetor Educational Award from the Society of Automotive Engineers, and twice received the Excellence in Undergraduate Teaching Award from the Undergrad Engineering Council in 1989 and 1991. Which brings us back to that yo-yo machine. The students had to start from scratch. First they had to learn how to use the CAD design software that was just then coming on the scene. Quesnel arranged for the students to visit local companies to learn about different plastics. Then they spent long nights in the computer lab and the machine shop—on weekends, and even into the last week before graduation, when other students were partying and getting ready to leave. “It was phenomenal,” says Lambropoulos. “Everything was machined by the students; no purchased equipment. The start of the course was early in January, and by graduation day, the machine was set up in the Hopeman (Hall) conference room and actually spitting out yo-yos. “The funniest thing is, and I remember like it happened yesterday, the first yo-yos that came out were really misshapen,” Lambropoulos says. But the students made last-minute adjustments, and then “we brought all the parents of all the seniors into the conference room to see it,” Lambropoulos says. Each graduating student left that day with a diploma – and a blue yo-yo as a memento. 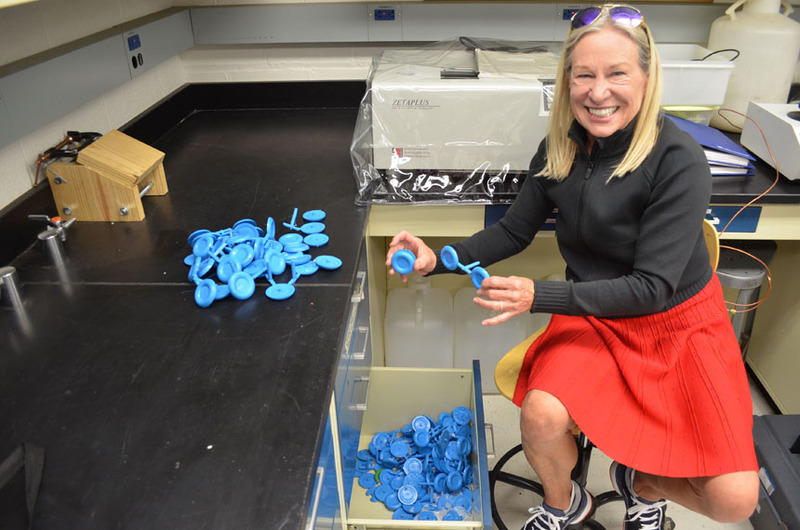 Below, Jill Morris with some of the blue yo-yos she discovered in a drawer.